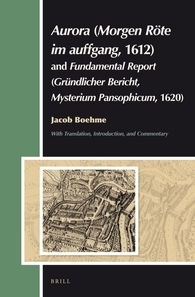 Jacob Böhme, Aurora (Morgen Röte im auffgang,1612) and Fundamental Report (Gründlicher Bericht, Mysterium Pansophicum, 1620), Brill, Leida 2014. Unfortunately, you will have to spend €225 for this deluxe 834-page volume, but the new Brill edition (2014) of Aurora (Morgen Röte im auffgang, 1612) and Fundamental Report (Gründlicher Bericht, Mysterium Pansophicum, 1620) by Jacob Böhme, 1575-1624 (translation, introduction and commentary by Andrew Weeks, and with Günther Bonheim in collaboration with Michael Spang as editor of Gründlicher Bericht) will quickly become a must-have book for all those interested in esotericism. There is no better edition of the highly influential Aurora, whose English translation places the translated text opposite to an edition of the German manuscript from the author’s own hand, and the Gründlicher Bericht, offered in a critical edition and translation, is normally hard to come by. Yet they represent the very cornerstone of Böhme’s thought. Böhme is admittedly a very difficult author to read, and his context seems today very remote (although the notes of the Brill edition do help). Why bother in 2014 with hundreds of pages of Böhme? One reason, as Antoine Faivre, would have it, is that Böhme is a crucial passage in the history and the very definition of Western esotericism. Without Böhme, it would become very difficult to understand Emanuel Swedenborg (1688-1772), Franz von Baader (1765-1841), Friedrich Schelling (1775-1854), Martinism, American Transcendentalism, Theosophy, and Anthroposophy. In addition, Böhme also belongs to the history of mysticism and of Christianity. Despite a certain anticlericalism, Böhme was also a bridge between Lutheran and Catholic spirituality. And to the history of philosophy. Georg Wilhelm Friedrich Hegel (1770-1831) called him the first German philosopher; Friedrich Nietzsche (1844-1900) and Arthur Schopenhauer (788-1866) struggled with Böhme’s idea of nature; Carl Gustav Jung (1875-1961) was truly in love with Aurora. And there were many others. One can be tempted to skip Böhme because he is so difficult. But the price is to be deprived of a full understanding of many other crucial thinkers in Western history, who derived themes and ideas from Böhme. Today, one area of investigation that is both promising and fashionable is the relationship between esoteric writings and modern visual arts. Here, again, Böhme has something to say. The German mystic had a considerable influence on both Philipp Otto Runge (1777-1810) and Johann Wolfgang von Goethe (1749-1832), particularly in the matter of the occult meaning of colors. Goethe’s ideas – and, to some extent, Runge’s – were disseminated in Theosophical and Anthroposophical circles through Rudolf Steiner (1861-1925) and influenced many leading modern artists. 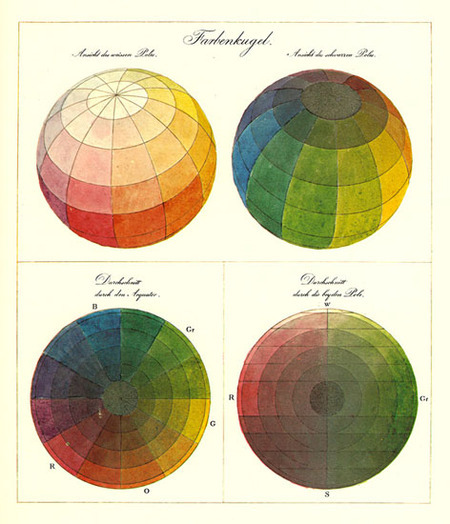 Now, both Goethe and Runge, one of the leading German Romantic painters, did rely on Böhme in many significant respects (see Runge’s Farbenkugel, or Color Sphere, in the picture). The Italian historian of art Flavia Matitti went so far to see an influence of Böhme (and of British Paracelsian physician Robert Fludd, 1574-1637) on some paintings by Futurists, including Giacomo Balla (1871-1958) (see her «“Pittura dell’avvenire” Arnaldo Ginna a Firenze tra esoterismo e futurismo», in Marco Cianchi [ed. ], Futur1smooggi, Ospedaletto [Pisa]: Pacini, 2011: 113-131). The influence of Böhme – often, admittedly, indirect – is truly ubiquitous. Getting back to his key works, jumping the intermediations, is now necessary. This edition would help both senior scholars and those who are new to the study of esotericism and mysticism to do just this.